McLaren has commendably gained eyeballs with its supercars like 650S, 650S Spider and the 675LT but it looks the company is nowhere in a mood to take the halt. At the 2016 Geneva Motor Show, they successfully took the curtains off their McLaren 570GT 2017. The model is looked ahead and anticipated to compete the Porsche 911 family and more. 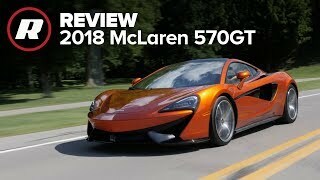 Let us have a look at the review of McLaren 570GT 2017 to know in detail about it. The interior of McLaren 570GT 2017 received some notable gorgeous changes. The glass panoramic roof and the almost 1/5th percent transmission tint over panels make the model look stunning. The increased glass area inside the cabin eventually invites a revision for the air conditioning system. There is a new luggage compartment at the rear end. The later brings extra 220 liter of storage room and thus with this model you get a total of 370 liters of storage space. Getting to the entertainment segment, you’ll get 12-speaker Boxers and Wilkins audio system and a touchscreen featuring infotainment and navigation system. For your comfort the interior details of McLaren 570GT 2017 include eight-way heated sports seats wrapped in premium leather while the Nappa leather accents and carbon fiber inserts further add to the glory. 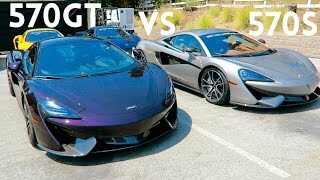 The exterior of McLaren 570GT 2017 has couple of similarities with its 570S sibling. Starting with the front fascia we have bold creases running over the trunk lid. The integration not only adds to sportier looks but also optimizes the airflow over the fenders. Beneath the bumper you can notices the aero blades producing high pressure area ahead of radiators. Moving towards the rear end, along the sides you can notice, massive side vents, dihedral doors and rear fenders with small intakes over them. AT the rear first thing to grab your attention is the redesigned engine hood, which now resembles to a trunk lid and a new grille. 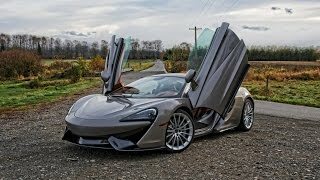 Thus rounding up the exterior details of McLaren 570GT 2017 I would call it sportier model with better aerodynamic inclusions. 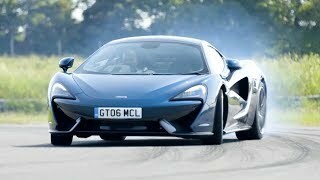 Powering the McLaren 570GT 2017 is a 3.8 liter Twin Turbo V8 engine generating total output of 562 hp and peak torque of 600 nm paired to seven-speed SSG automatic transmission. With this the top speed of McLaren 570GT 2017 touches the mark of 204 mph while the 0-62 mph sprint can be knocked in 3.4 seconds.